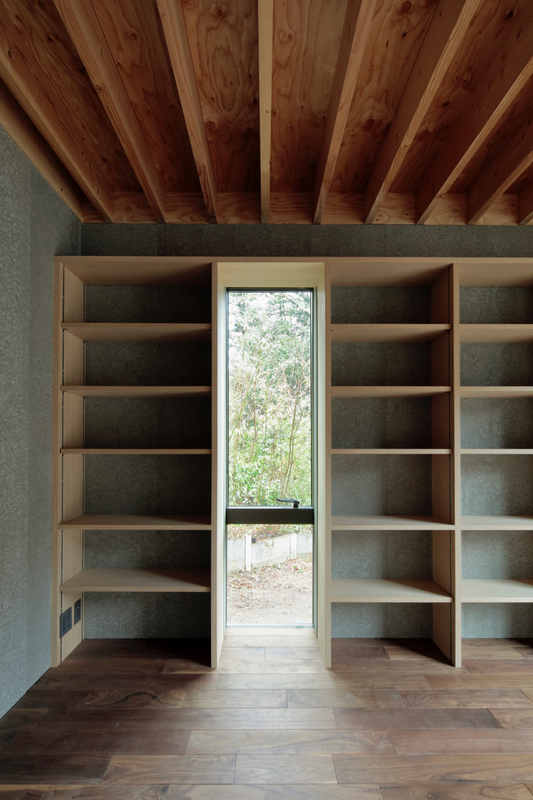 This project is a house that functions both as a workplace for a couple, who are both international researchers, as well as a guesthouse for guests both from within and outside the country. To the back of the site is a quasi-national park that boasts the richest greenery closest to central Tokyo. 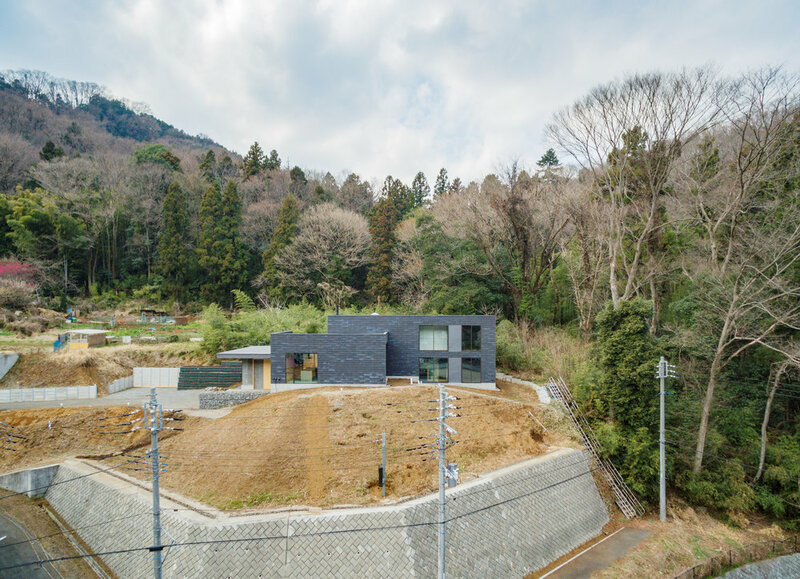 This rare site is located in an Urbanization Control Area that was once a site planned for the construction of a company dormitory — the plan had fallen apart and the site had been abandoned. While the site is over 1,000 sqm in size, over half of it lies on an incline and only a small segment of it is flat. Our initial designs therefore mainly focused on keeping the undulations in the landscape as is — in order to maintain costs at a reasonable rate — and planning the house so that it would connect with the surrounding landscape in a diverse way. 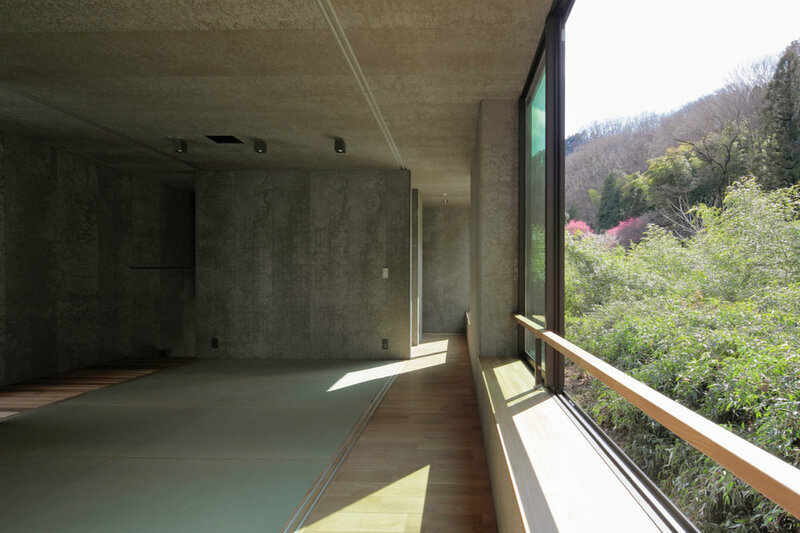 From the planning of the house, we went to on study the materials that would compose it. The rich nature afforded by the quasi-national park not only brought with it a beautiful landscape but also strong winds, fallen leaves and a variety of creatures. While materials that are currently used in the typical home are selected for their ability to remain in a new, clean state, both on the interior and exterior, such a modernistic approach felt as though it would be overwhelmed by the strength of the nature surrounding the home. The issue of the site and the building — in other words, the separation of context and text — as well as the issues of materials and time, are contradictions that have been espoused by architecture since the modern age; we have simply pretended to be oblivious to such issues in the many, cleanly developed residential neighborhoods in our current age. On the other hand, the idea that only natural materials like wood and stone have the ability to properly engage in the issues of nature and time rely merely on nostalgia and ignore the current limitations in our natural resources. As we worked on this house, we were faced anew with such issues regarding materials and time. At the same time, an engineer at a manufacturer we had worked with before responded to our problem and presented us with a material that had never been used before. This was the recycled material (called SOLIDO) made from industrial waste such as blast furnace slag and regenerated paper pulp, which we used on the exterior surface of this home. This home experimentally adopts the industrial material SOLIDO, using it in the same way as wood, stone and concrete. At the same time, it is designed without the use of plaster boards and cloths, found in typical homes. In the design of this home, we also focused on realizing our belief that architecture is supported not only by advances in materials, facilities and design methodologies but also by the fundamental passion and technologies of the craftsmen involved and that the role of the architect consists of how best to construct this relationship. While this home is equipped with advanced insulation capacities and a whole house air-conditioning system, these systems hide within rooms that are both closed and open to the surrounding environment and form a unified whole with the landscape together with the furniture and fixtures placed throughout the house. Universality and site specificity — in other words, the seemingly contradictory quality of being both universally available and yet only able to exist in a single, particular place — is a value found in the traditional home, but lost in buildings since the modern age. It is a quality that we constantly strive towards in our housing designs. 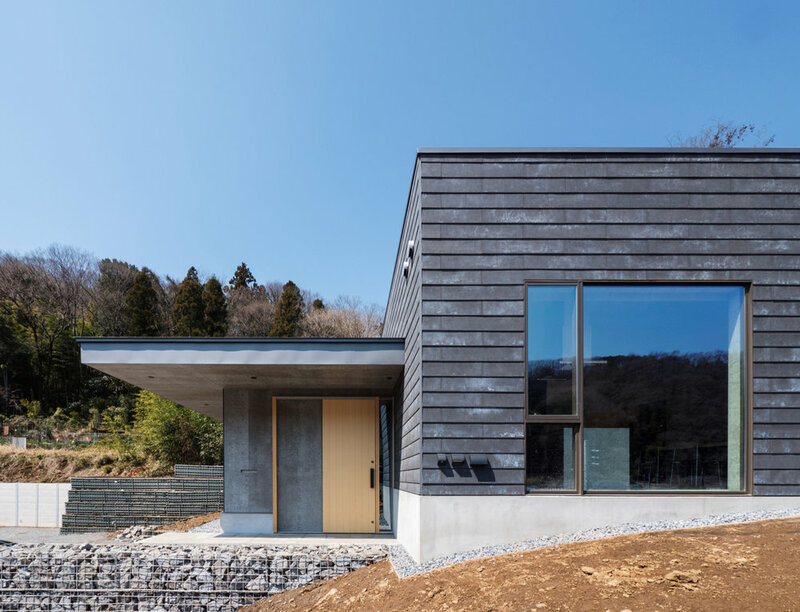 It was therefore only inevitable that this home, while different in materials and form, would look more similar to the traditional Japanese house with a tiled roof as opposed to a typical modern home; and we hope that it presents a certain direction that can be taken for housing in the future.